Whether on dipped beams or main beams, this func-tion allows your headlamps to follow the direction of the road ahead. The rear pneumatic suspen-sion enhances driving comfort and maintains a constant body height whatever the vehicle load. These light up the zones fac-ing the driver’s and passen-ger’s doors. Sensors located in the bumpers detect obstacles. Measures the size of a space and informs you of the possi-bility of parking. Automatically tilts in reverse gear. Press on control A located on the control panel to the left of the  d a s h b o a r d .   T h e   f u e l   ﬂ   a p   a u t o m a t i -cally opens up fully. Insert the nozzle so as to push in the metallic gate valve B.  P u s h   t h e   f u e l   ﬂ   a p   t o   r e c l o s e   i t . 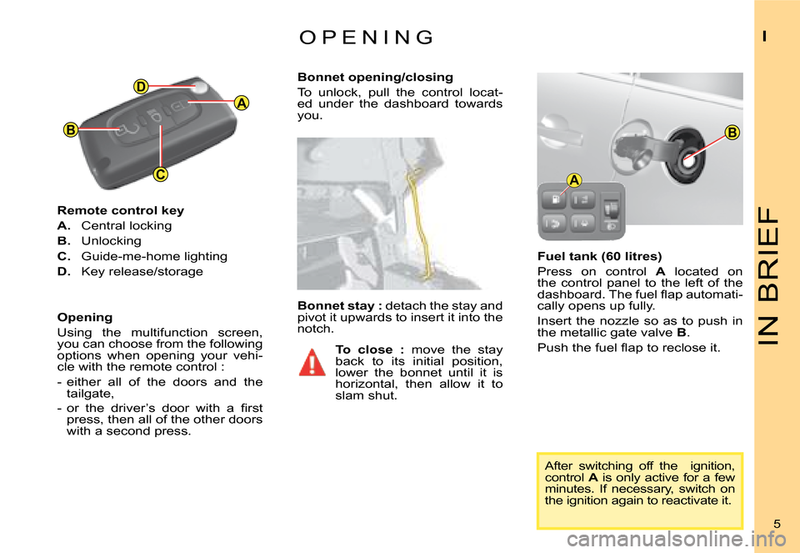 After switching off the ignition, control A is only active for a few Aminutes. If necessary, switch on the ignition again to reactivate it. Bonnet stay : detach the stay and pivot it upwards to insert it into the notch. To close : move the stay back to its initial position, lower the bonnet until it is horizontal, then allow it to slam shut. To unlock, pull the control locat-ed under the dashboard towards you.  -   o r   t h e   d r i v e r ’ s   d o o r   w i t h   a   ﬁ   r s t  press, then all of the other doors with a second press. 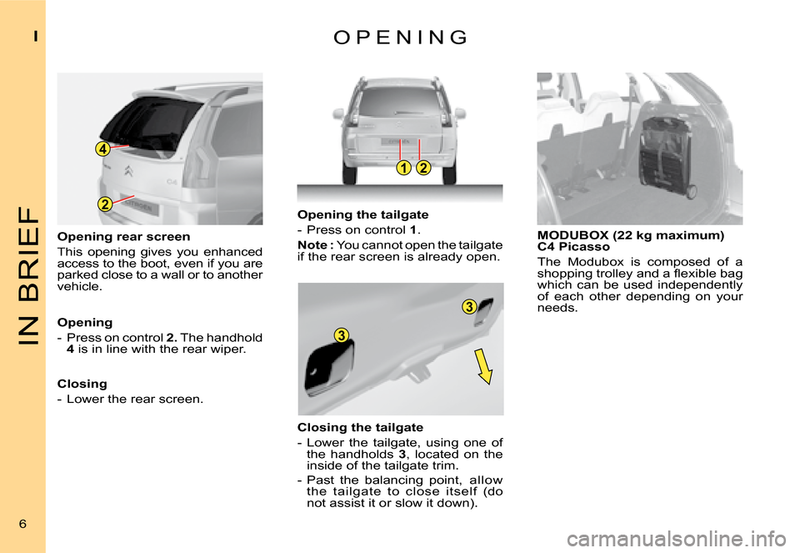 This opening gives you enhanced access to the boot, even if you are parked close to a wall or to another vehicle. - Press on control 2. The handhold 4 is in line with the rear wiper. - Lower the rear screen. - Press on control 1. Note : You cannot open the tailgate if the rear screen is already open. - Lower the tailgate, using one of the handholds 3, located on the inside of the tailgate trim. - Past the balancing point, allow the tailgate to close itself (do not assist it or slow it down). The Modubox is composed of a  s h o p p i n g   t r o l l e y   a n d   a   ﬂ   e x i b l e   b a g  which can be used independently of each other depending on your needs. 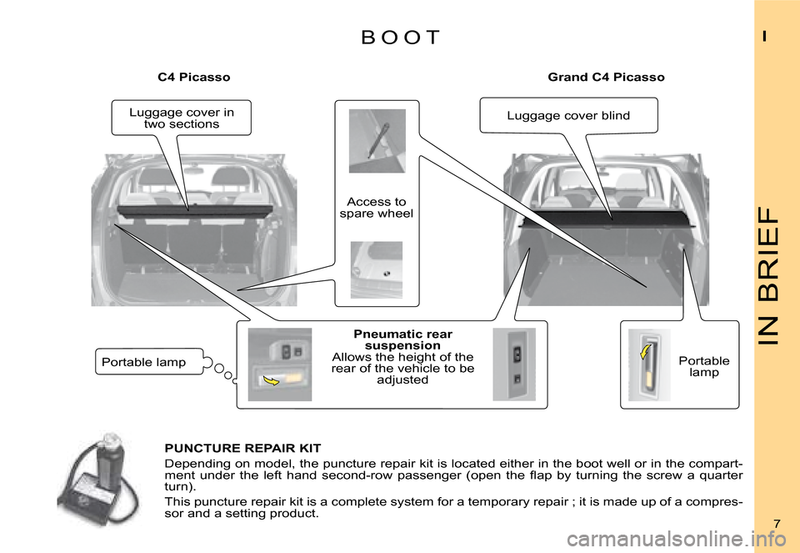 Depending on model, the puncture repair kit is located either in the boot well or in the compart- m e n t   u n d e r   t h e   l e f t   h a n d   s e c o n d - r o w   p a s s e n g e r   ( o p e n   t h e   ﬂ   a p   b y   t u r n i n g   t h e   s c r e w   a   q u a r t e r  turn). This puncture repair kit is a complete system for a temporary repair ; it is made up of a compres-sor and a setting product. Fold the concertina plates (1 2 3) arranged on each of the third-row seats. Pull on the black belt F located on the seat backrest. 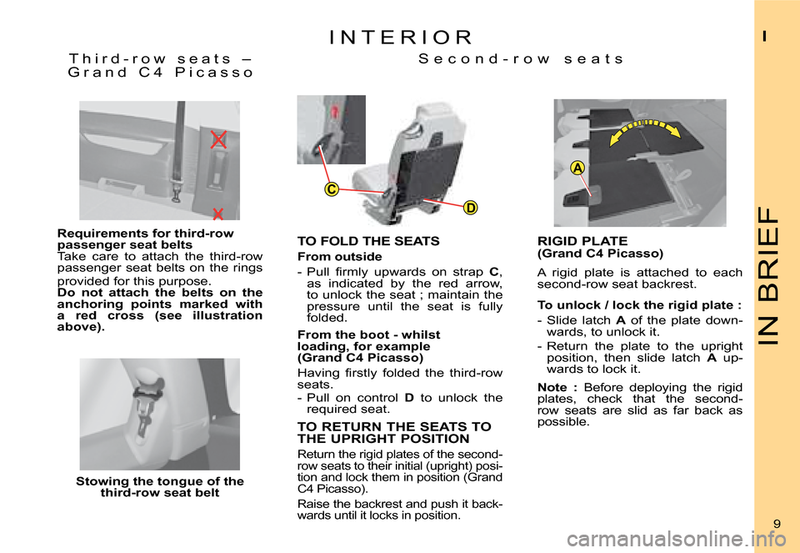 Put the three sections of the con-certina plates (1 2 3) to their ver-tical position then pull on the red belt G.
Before moving the third-row seats, return the rigid plates to the upright position and lock them. Do not leave objects either on or underneath the second-row seats when you are folding them. Pull on control E located at the top of the second-row seats backrest. Before moving the third-row seats, do not forget to lock in  t h e   r i g i d   p l a t e s   ﬁ   r s t   ( l o c a t e d  at the base of the second-row seat backrests).  -   P u l l   ﬁ   r m l y   u p w a r d s   o n   s t r a p  C, as indicated by the red arrow, to unlock the seat ; maintain the pressure until the seat is fully folded. 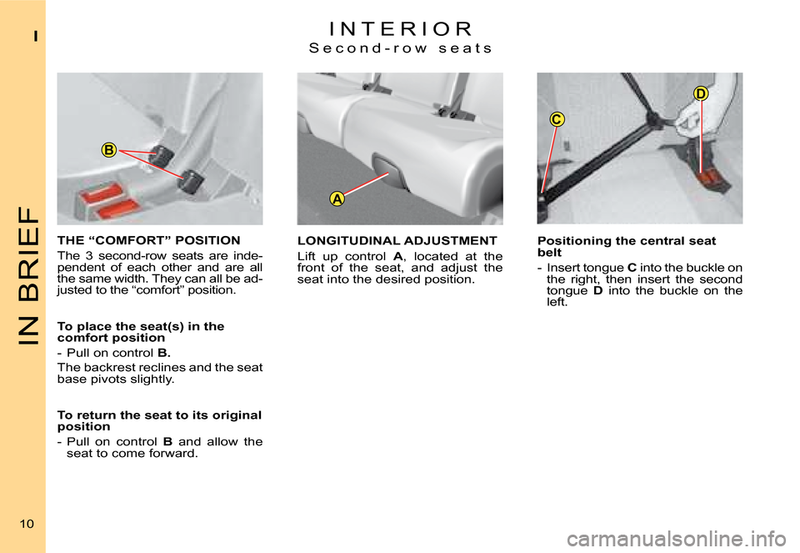  H a v i n g   ﬁ   r s t l y   f o l d e d   t h e   t h i r d - r o w  seats.- Pull on control D to unlock the  r e q u i r e d   s e a t . 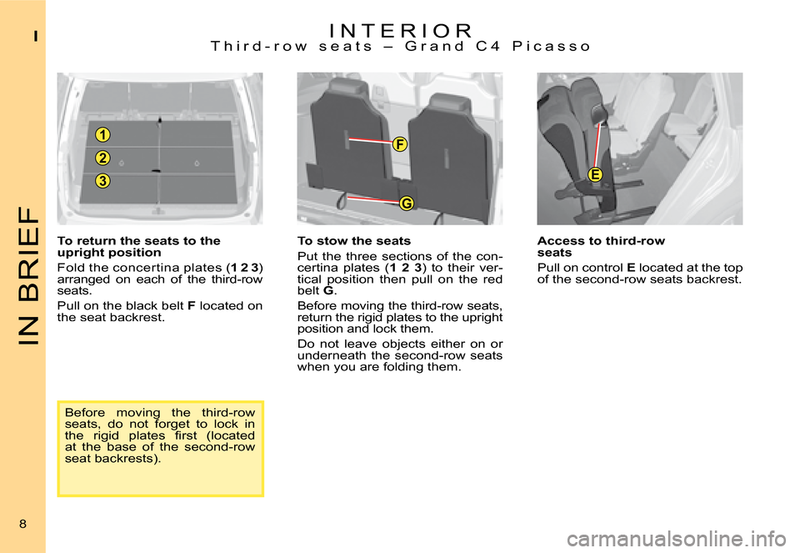 Return the rigid plates of the second-row seats to their initial (upright) posi-tion and lock them in position (Grand C4 Picasso). Raise the backrest and push it back-wards until it locks in position. A rigid plate is attached to each second-row seat backrest. - Slide latch A of the plate down-wards, to unlock it. - Return the plate to the upright position, then slide latch A up-wards to lock it. Note : Before deploying the rigid plates, check that the second-row seats are slid as far back as possible. Requirements for third-row passenger seat belts Take care to attach the third-row passenger seat belts on the rings provided for this purpose.Do not attach the belts on the anchoring points marked with a red cross (see illustration above). The 3 second-row seats are inde-pendent of each other and are all the same width. They can all be ad-justed to the “comfort” position. - Pull on control B. The backrest reclines and the seat base pivots slightly. - Pull on control B and allow the seat to come forward. 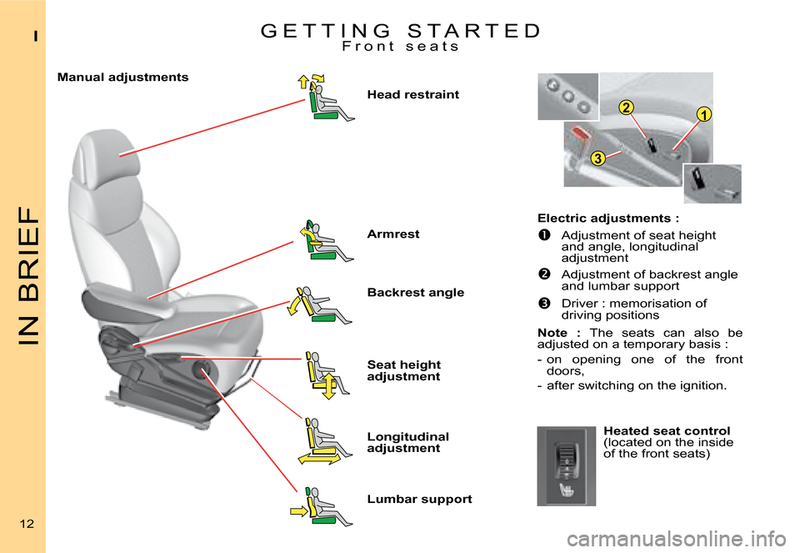 Lift up control A, located at the front of the seat, and adjust the seat into the desired position. - Insert tongue C into the buckle on the right, then insert the second tongue D into the buckle on the left. - after switching on the ignition. 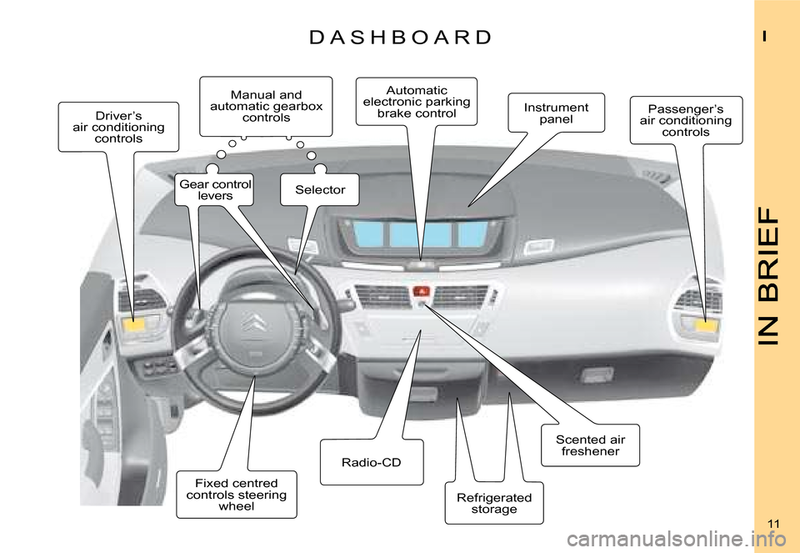 The steering wheel can be adjusted in terms of height and reach. Unlock the steering wheel by pull-ing control A towards you. Adjust the position of the steer-ing wheel then lock it pushing the control back fully.  T h i s   m o d i ﬁ   e s   i t s   r o l e   a u t o m a t i c a l l y  and progressively between day use and night use. It can be deactivated using control 1. This allows you to monitor the rear passengers. It can be folded away to eliminate dazzle. This operates with the ignition switched on. From the driver’s seat, select the rear view mirror by moving control 1 to the left or right, then adjust  t h e   r e a r   v i e w   m i r r o r   a s   r e q u i r e d   i n  the 4 directions using control 2. 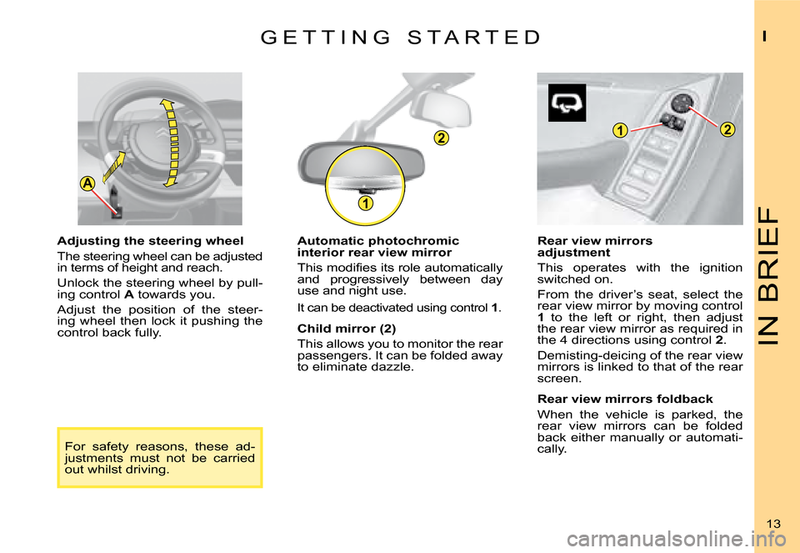 Demisting-deicing of the rear view mirrors is linked to that of the rear screen. 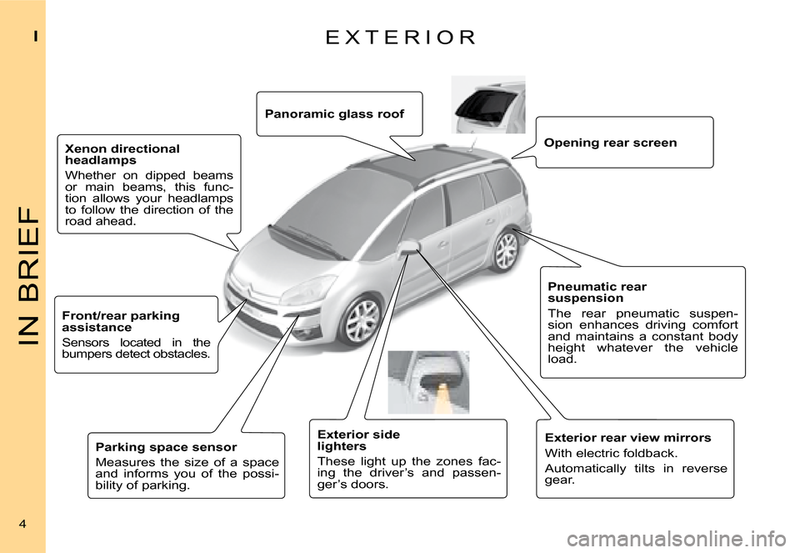 When the vehicle is parked, the rear view mirrors can be folded back either manually or automati-cally.For safety reasons, these ad-justments must not be carried out whilst driving.